Named after Sir Elly Kadoorie, the founder of The Peninsula Hotels’ parent company, who is also the grandfather of current Chairmanis, Sir Elly's on the top floor of The Peninsula Shangha is easily one of the most exquisite restaurants you can find in Shanghai. Once on the 13F, the lounge and bar with a stunning and dramatic decor in a combination of classic and contemporary twist will appear in front of you, with a stunning overlooking of the bund and Pudong skyline. Walk tall the way down the lounge and the main dining room is right in front of you. 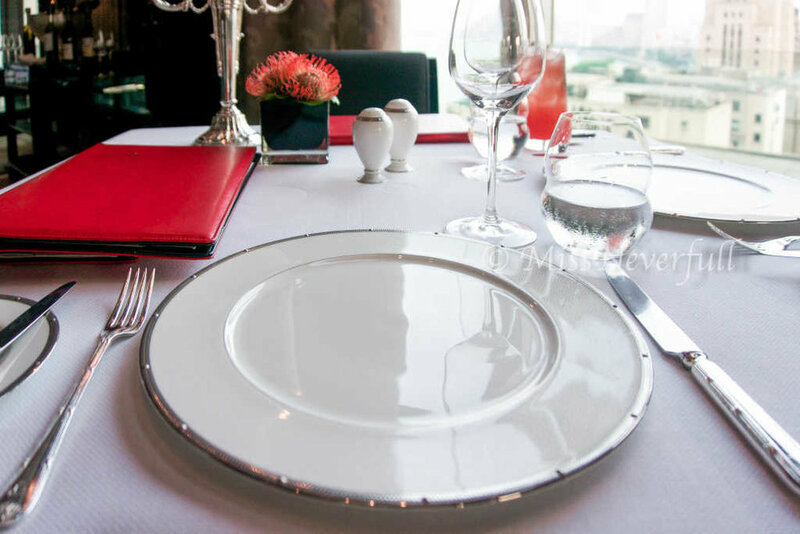 Sir Elly's serves set lunch everyday, for dinner, a 5-course tasting menu (CNY 780) and 6 Courses of the Chef’s selected Signature Dishes & Seasonal Flavors (CNY 880) are served as well as a la carte menu. We picked the 6-course menu by the Exexutive Chef Terrence Crandall. Terrence started cooking when he was 9 and has over 20 years experience in the kitchen, he joined Peninsula Chicago in 2001 and has been with the group up to now. We were firstly served with assorted freshly baked breads - black truffle, olive with iberico, whole wheat and plain baguette. Both my partner and i picked the black truffle roll, the aromatic roll was quite flaky and flavorful - probably the best bread i had in a fine dining restaurant in Shanghai so far. How i wish i can have this everyday. In comparison, the olive bread with iberico ham was quite average. 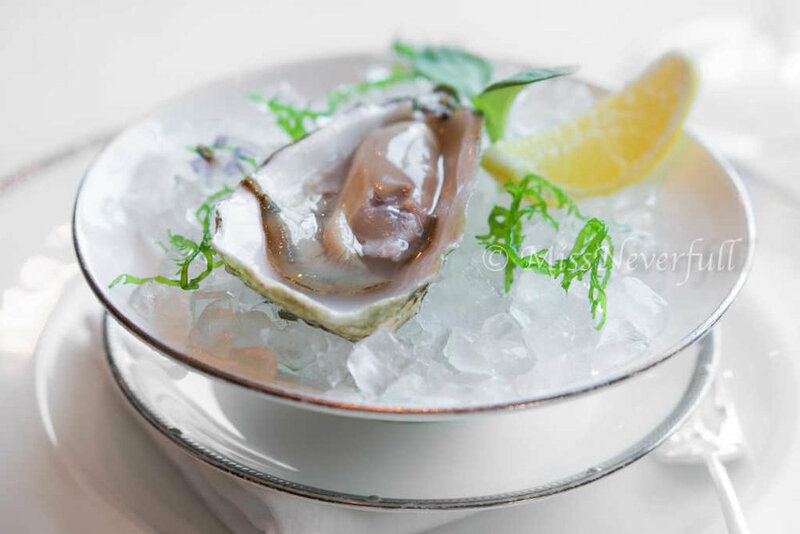 Before starting the meal, we were served with the fresh Gillardeau oyster, the clean and refreshing flavor awaken our taste bud. 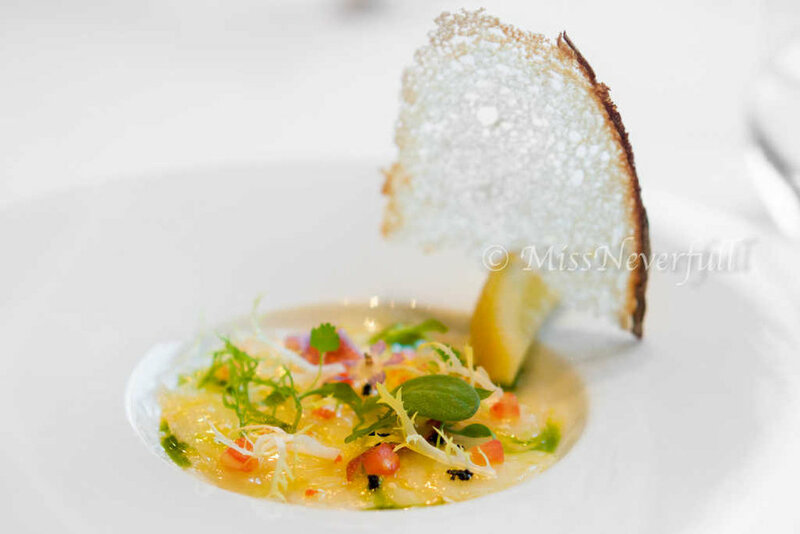 The first course was Langoustine Carpaccio (生海鳖虾片), the thin sliced of fresh langoustine tail was seasoned with ginger citrus dressing, which was very refreshing. Its creamy texture full of umami flavor paired will with the crispy rye melba. Followed by the signature foie gras served on a bed of Wuxi peach and Inniskillin ice wine. Foie gras itself was very smooth and rich, coated with hickory nut to enhance the texture and aroma. One of the chef's siganture dish is the green and white asparagus soup over a slow cooked egg. The egg was perfectly cooked, its soft and creamy texture, together with the lightly creamy soup was really in a harmony. The asparagus soup was a bit weak for our liking but we really enjoyed the soft combination. Move on to the mains. The Maine lobster was well-cooked, it has a lovely butter scent and flavor, its succlent texture and umami flavor was quite enjoyable. While we found the tomato caponata was a bit strong that its sourness went beyond the flavor of lobster. I had the chicken breast for main and my friend had wagyu. The chicken breast was a bit bland and not lean enough. Side by the Polenta, which is a Central European dish made by boiling cornmeal into a thick, solidified porridge and grilled. 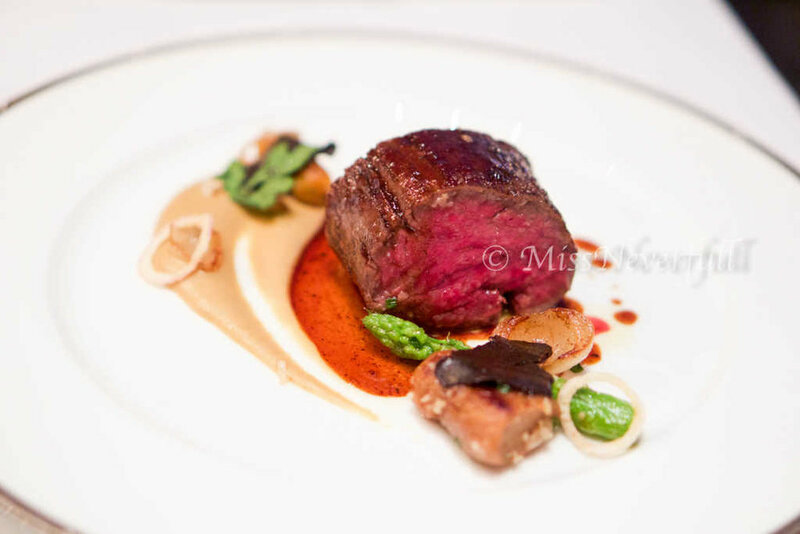 The Wagyu Beef Tenderloin was succulent and flavorful, the Bordelaise sauce works very well on the beef. The pre-dessert came before the main desserts. The goatcheese ice cream has a very fresh and clean flavor while the vanilla seeds added a lovely twist. The orange zest brought a hint of refreshment and the almond cookie cumble enhanced its textural. Cehf Terrence prepared two special desserts for us, which will be featured on the new menu in a few days. The first one was made of the baked nut ice cream coated with milk chocolate,topped with whipped peanut cream. It was unexpectedly light and flavorful. Peanut lovers must try. In comparison, we preferrend the second dessert, made of 66% chocolate candy bar, crispy ganache, matcha and mint sorbet (66% 巧克力排, 香脆巧克力甘纳许,抹茶,薄荷雪葩). The mint and matcha flavor well-balanced with the rich and crunchy chocolate. Sir Elly's is so far the first restaurant i have been to that serves petit fours in a trolley in Shanghai, featured macarons, noughats, chocolate prezels, jelly candi and chocolates. After the dinner, we walked upstairs to the terrance to enjoy the breathtaking views from Sir Elly’s Terrace, where drinks and snacks are served and soft music and romance await, overlooking the twinkling lights of the Bund and the futuristic Pudong skyline. The food was surprsingly not bad (because most of the Western restaurants in hotels in China was quite average), the service and ambiance were very impressive. All the servers have very good knowlege of the menu and food they are serving. The view was breathing taking. All in all, Sir Elly's is definitely a special occasion kind of place.